I love Sing a Song Estate, because each villa is totally independent of the other, so you can rent it with another family and still have privacy. One villa has three suites, and the other has two suites. Both have their own pool, beach access, and common amenities. Modern beachfront villa located in Turtle Tail! Sing a Song Estate is a beachfront, five-bedroom estate in the residential Turtle Tail area. Two villas make up this estate, and both have panoramic ocean and sunset views. Sing a Song I and II both have an infinity pool in the center of their lounging deck. Sing a Song II’s pool also has a waterfall feature. 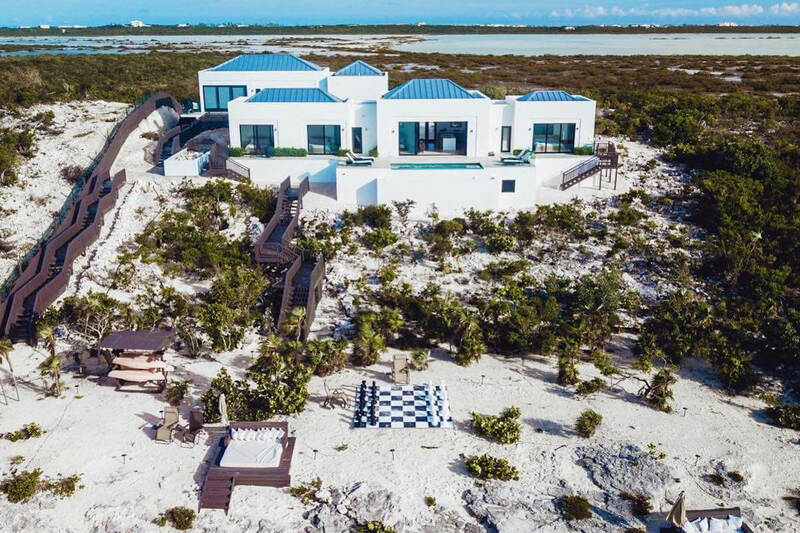 Their private beach has kayaks, a life-sized chess board, and a lounging pavilion. Sliding glass doors lead from the pool decks into the villas’ common area, where guests can watch movies on the flatscreen Apple TV and cook in the kitchen. The cozy kitchens have bar seating, stainless steel appliances, and ocean views. The homes have WiFi throughout, and Sing a Song I has a laundry room with extra-large capacity appliances. All five bedrooms have ensuite bathrooms, pool deck access, and individual air-conditioning units. Sing a Song I has one king suite and two queen suites, while Sing a Song II has one king suite and one queen suite. Both villas have queen sofa beds in their living rooms. Grace Bay Beach is only a 12 minute drive away, so there’s several water sports and restaurants within reach. Kiteboarding is great on the south side of the island though, so guests don’t have to leave the villa to have fun in the sun. Rates do not include: tax of 12%, island charges of $475. Beachfront to a private beach, otherwise it is a 12 minute car drive to Grace Bay Beach.